China's research icebreaker Xuelong, or Snow Dragon, is expected to return from the Antarctic to Shanghai in mid-March, a month ahead of schedule. The return will come after a four-and-a-half-month expedition, according to the Chinese Arctic and Antarctic Administration. 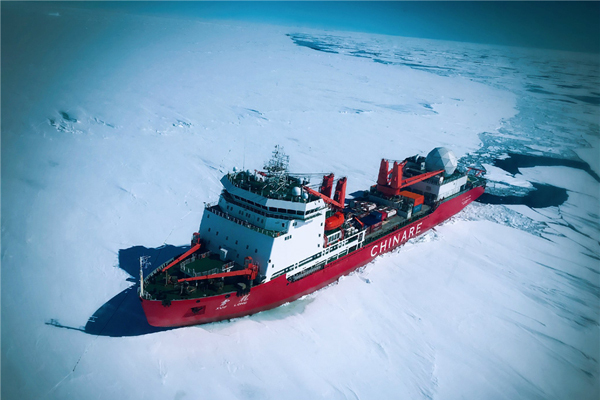 The ship, on its 35th Antarctic expedition, departed from Shanghai on Nov 2, with missions including the construction of an airfield near Zhongshan Station, completion of the second stage of Taishan Station, continuing the construction of the country's fifth research station near the Ross Sea, and various marine observations and studies. The crew however adjusted Xuelong's voyage route after a collision with an iceberg on Jan 19, when the ship was caught in a sudden thick fog on the Amundsen Sea. The collision broke the ship's mast and left about 250 metric tons of snow and ice on its front deck. According to the administration, Xuelong on Jan 25 arrived at Changcheng Station on Antarctic, where an examination by vessel experts found that its key parts, including its engines, shafts and communication systems, were operating properly. After the repair to its front deck, the vessel departed from Changcheng Station on Jan 29. It will pick up researchers working at Zhongshan Station before it returns home.